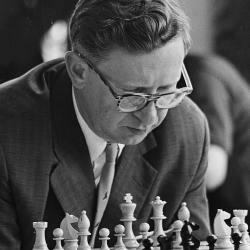 An overall great player, Vasily Smyslov was a Grandmaster who could play all phases of the game at a top level. Known for his strong positional style and machine-like technical skills in the endgame, he could also pull out spectacular tactics in his games as well. Smyslov was one of the best world championship contenders in history, winning the title in 1957 and also being a candidate for the championship eight other years. Racking up the accomplishments, Smyslov was a champion for all players to learn from. Vasily Smyslov learned to play chess at 6 years old. Smyslov’s father was also an accomplished chess player and became his son’s first teacher. Smyslov didn’t begin to play in tournaments until he was 14 years old. At the age of 17 he won the USSR Junior Championship and tied for first in the Moscow City Championship. Smyslov continued to play well as he progressed and was one of the five players picked to play in the 1948 World Championship after Alekhine had died. He came in second in the tournament but got another chance in 1957 when he played Botvinnik for the championship. He won this match and became the World Champion for a year. He only held on to the title for a short time because Botvinnik got a rematch the next year and won the title back. Throughout the rest of his life, Smyslov continued to be a very strong player and had a great tournament record after World War II. Smyslov passed away because of heart failure on March 27, 2010.